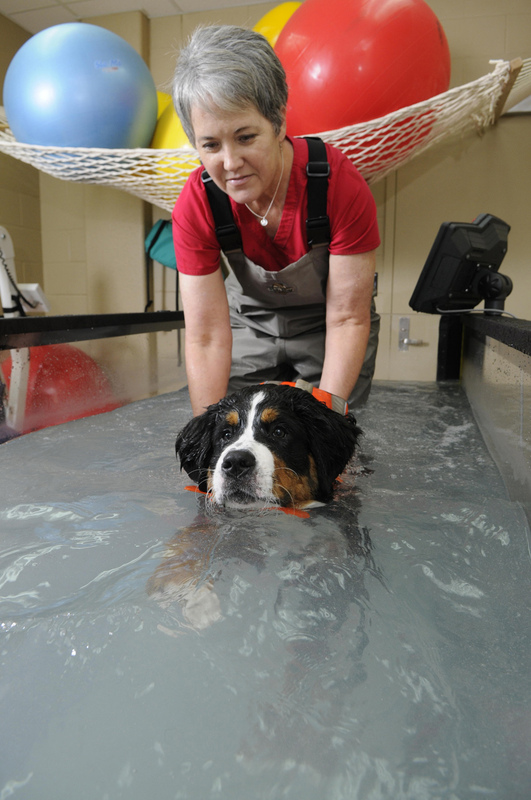 MISSISSIPPI STATE – A whirlpool bath, oatmeal hair rinse, blow-dry and massage may sound like a day at the spa, but it is a physical rehabilitation session for Curly, a patient at Mississippi State University’s College of Veterinary Medicine. The Animal Health Center operated by CVM is one of a handful of veterinary programs across the United States with the qualified staff and financial support to operate a rehabilitation clinic. Curly, a labradoodle with a disc herniation that left him unable to move his hind legs, is a regular patient at the clinic. His custom-fitted, two-wheeled cart elevates his hind legs so he can pull himself with his front legs. Whitfield said the goal of these various therapies is to keep Curly’s muscles from atrophying and to maintain his cardiovascular health. After one such rehabilitation session with Whitfield, Curly rested on a plush dog bed and looked like any other dog. But when rehabilitationist Ruby Lynn Carter walked into the center, Curly scrambled – dragging his hind limbs – to greet her. She and Whitfield put him in his harness and cart, and in moments he was running from person to person in the clinic. Wardlaw, whose commitment to the physical rehabilitation unit resulted in restructuring office spaces to better accommodate the necessary equipment, said the animals are very motivated to participate in the program. Framed portraits of these patients hang on the wall. They include Lucky, who is nearly 17 years old, and Jack, a black Lab who uses a wheelchair for mobility after a fibrocartilaginous embolism. Third-year CVM student Kelley Comer explained the condition as a stroke to the spine that left Jack with partial use of his legs. In addition to on-site therapy, the staff at the Animal Health Center’s rehabilitation clinic provides cart fittings, orthotic brace fittings, nutritional counseling and customized plans for home rehabilitation. For special-needs dogs like Curly, Lucky and Jack, physical rehabilitation offers an improved quality of life. “Seven years ago, people didn’t know that physical rehabilitation for animals existed. 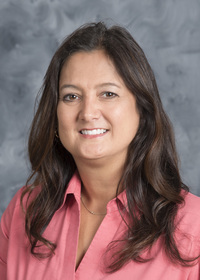 Now that we’re aware of how much it can benefit humans, it’s easier to see the parallels in what it offers animals,” Wardlaw said. To watch a video about the physical rehabilitation program at CVM, go to http://www.cvm.msstate.edu/.